(Newser) – A Florida grandmother tells WFLA she's about to be evicted and put out on the street, all because she allowed her 1-year-old grandson to move in with her. The Pine Haven Mobile Home Park is a retirement community with a no-kids-allowed policy. But Donna Souza's daughter is battling a drug addiction and can't care for her son Bryson. Souza allowed Bryson to come live with her last year. "I don’t want him put in foster care," she says. "He doesn’t deserve that." 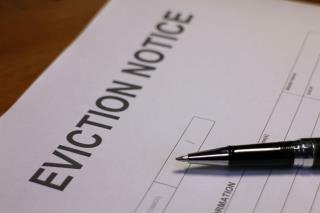 On Monday, she says she got an eviction notice giving her 30 days to move out. While I can sympathize with the child, I can also sympathize with the neighbors. They have moved into an adult only complex for a reason. Many elderly folks have difficulty with the noise generated by an infant. She knew the rules when she moved in, she has been warned, she had more than enough time to find another place to live. What kind of an example is this whiney woman for her grandchild? Why is the choice that she live there or the streets? Find another apt to rent. Get food stamps and welfare to help. That's what it is there for. Grandma may have to go back to work. It's a horrible situation but it isn't the residents fault. They choose to live where there are no kids.